Dear friends, sorry for that huge delay until my pictured trip report starts. But so much happened inbetween - and at least it was not easy to sort out 1.500 pictures and transfer it on the right media. But now we are on the beginning of our trip. Why start on a Tuesday? Well, the weekend before Regine was out on a mountain cottage weekend with friends, i had an event in a friends company and on Monday i had an appointment at my doctor (had a big cut on my head and they had to pull the strings). The big advantage is: you have no holiday traffic on our highways and so it is just the normal madness. So we started quite early about 7 a.m. and had our first stop near Fulda. 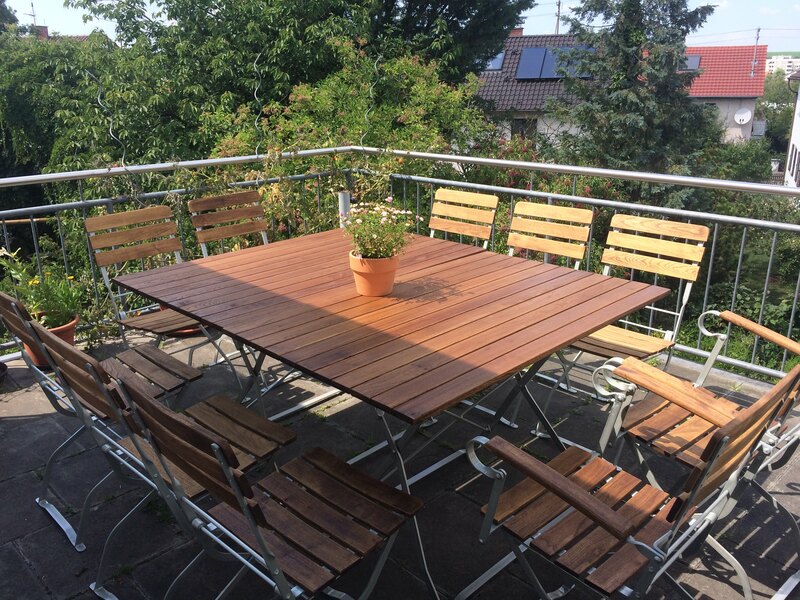 We needed new furniture for our terrace and had found an offer in the internet. Since the selling company was near our route, we decided to have a personal look first and so the furniture arrived soon after our return. 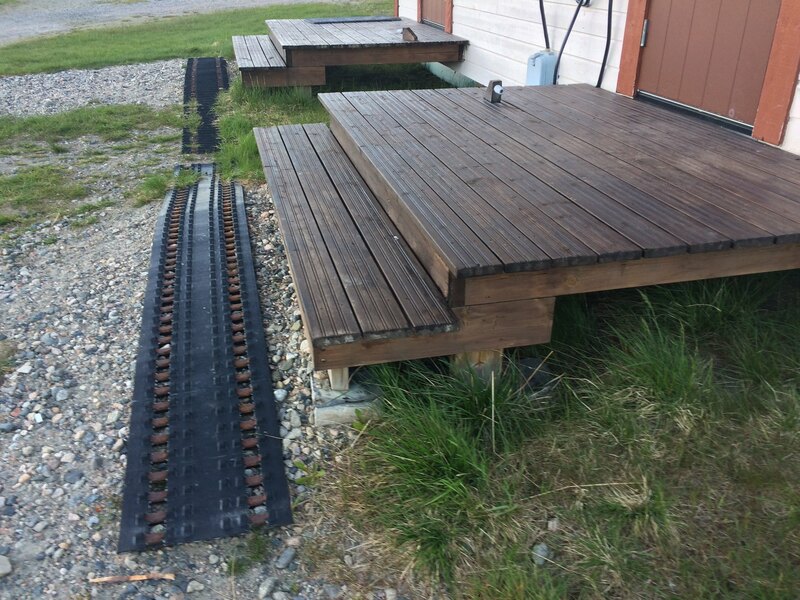 These are typical furnitures for our German "Biergarten", so they should be very solid. You can sit on them for many hours, that we knew before. 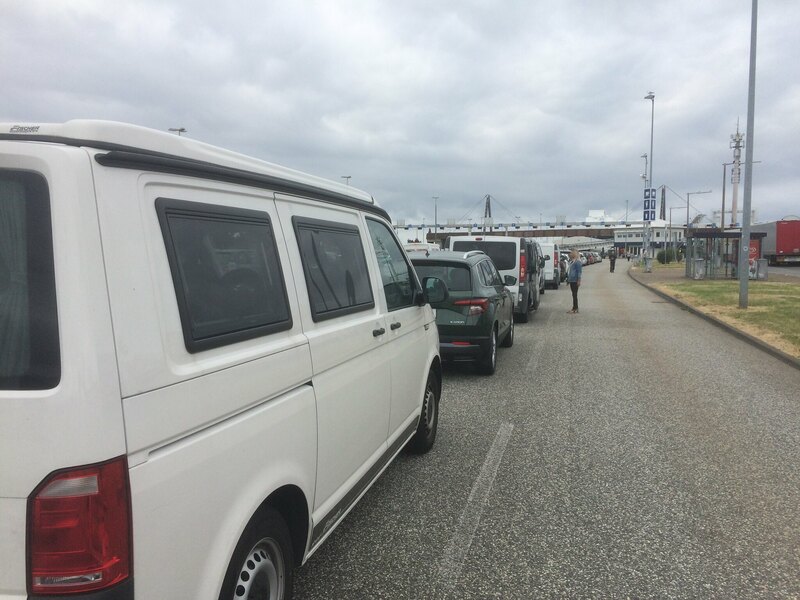 For me a holiday trip often begins after crossing the border and / or wait in a ferry queue. Her we are at Puttgarden after a very smooth 800km ride through Germany without any traffic jam. Unfortunately they had some unknown difficulties with the ferries and so we had to wait two hours for the ferry... always there is something. 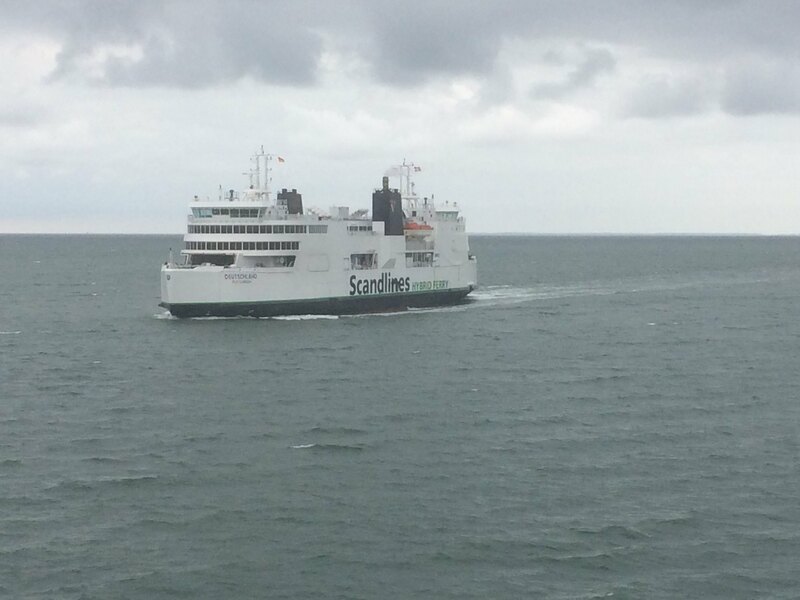 As we finally were on the ship, they had activated the whole fleet and we met all the sister ferries in a 15 min rhythm. 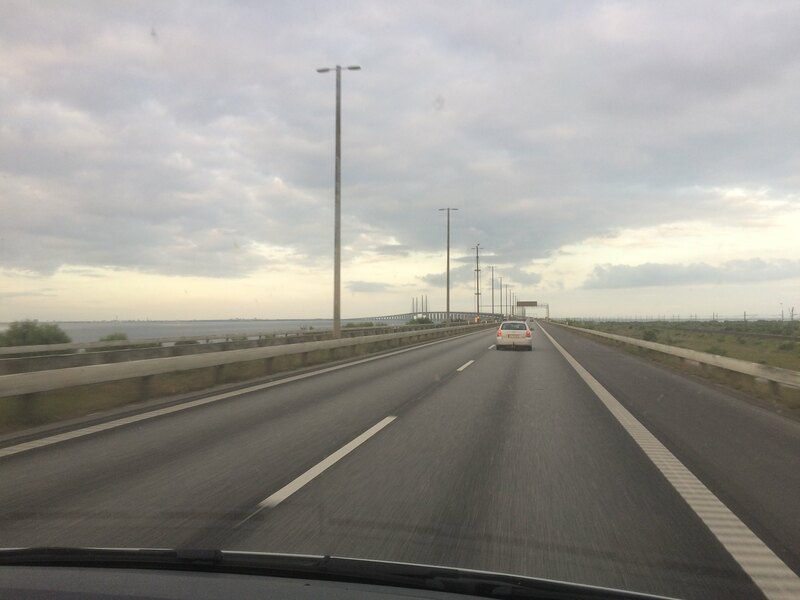 So it was finally 9 p.m., as we reached the Öresundbridge from Kopenhagen to Malmö, where we visited dear friends and had a late dinner. Last edited by Ralf__; November 14th, 2018, 16:36. I have looked forward to see your pictures, so it will be exciting to follow this thread now. Oh that is nice! Thank you and have fun! It was late this evening, because we had to taste the German beer i imported to our German friends in Malmö. After a late breakfast we went out to a trip in the city. 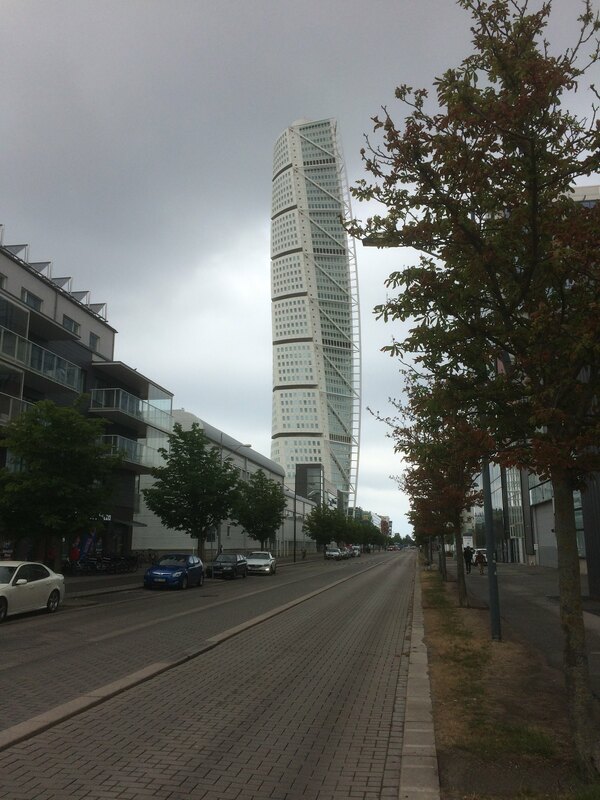 They moved recently from Helsingborg to Malmö and so it was our first visit there. 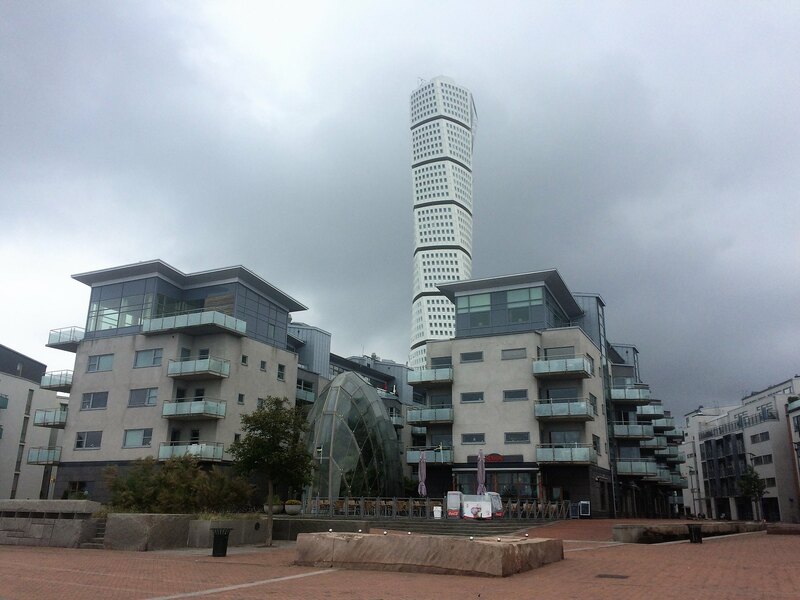 First what you have to see is the "Turning Torso", which is the center point of a new, modern city quarter. Attractive appartments with sea view were erected, new shops and café's shall bring life in this scenery, no cars are allowed in wide parts and the seaside is really beautiful. 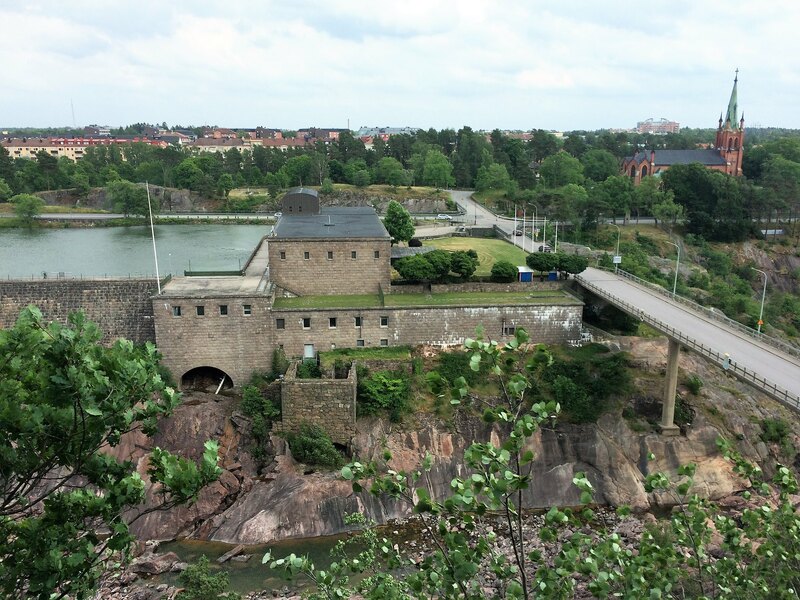 This part of the city is called Västra Hamnen and is indeed worth a walk through. There also some huge supermarkets, so you can combine shopping and free parking with that walk! In the distance we saw the bridge we passed yesterday. 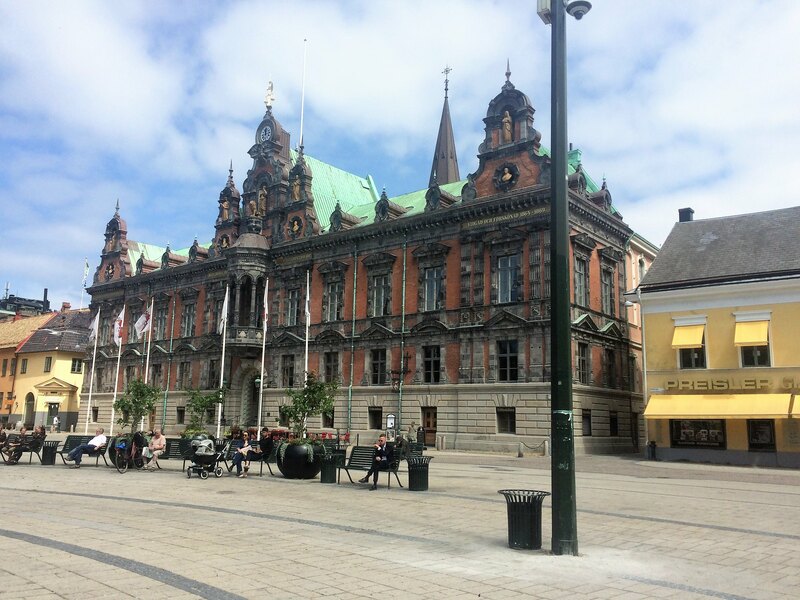 Later we proceeded on the centre of the city with it's impressing town hall. Beside there is the Stortorget building with the famous Apoteket Lejonet. If you have the time, have a look inside. Our i-phone cameras are too poor for taking inside pictures of this place. 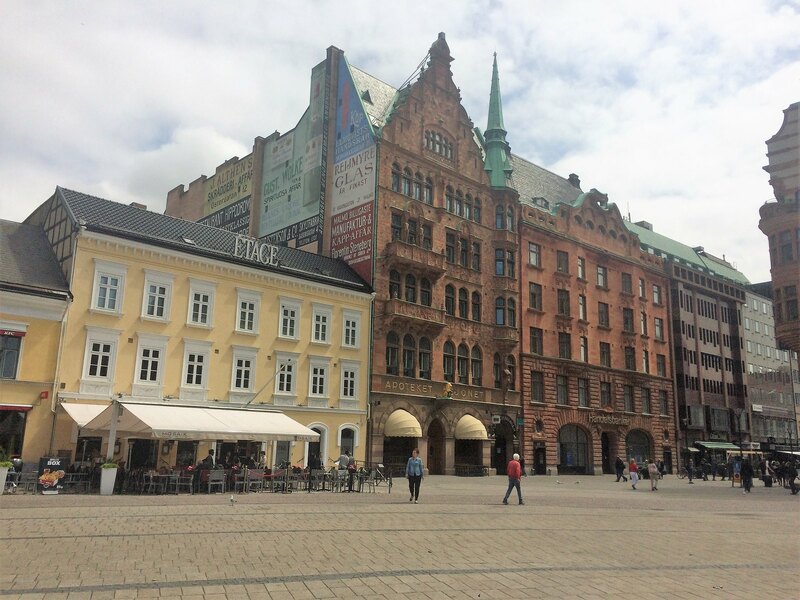 The whole historic city is very nice and pittoresque, for sure also during the evening, a lot of inviting bars and restaurants are offering also outside places. In a few meters distance you can find the Form Design Centre, unfortunately in a big modification during our visit. But normally a buiding with innovative design ideas. And at least a wonderful ensemble of buildings. I took the picture out of a window in the 3rd floor and it shows the main entrance to the street. 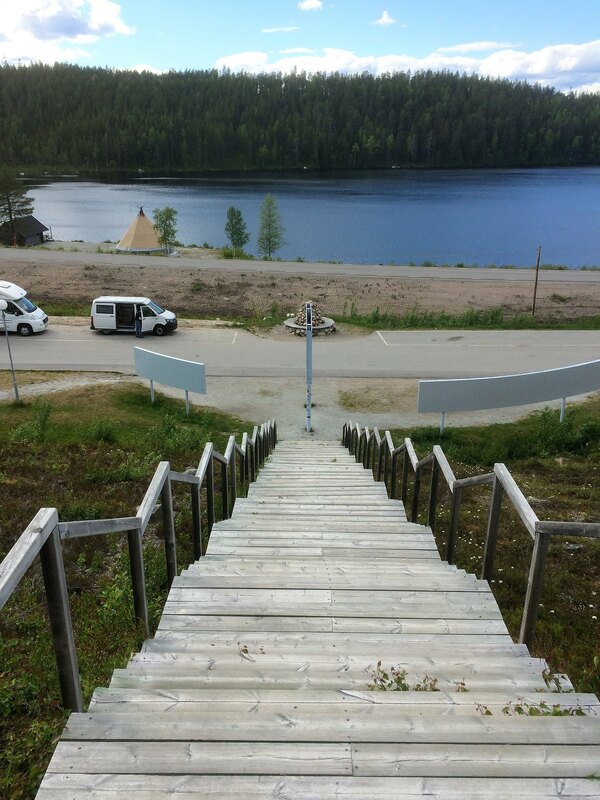 In the morning it was raining, but the weather was improving and so our friend proposed for the afternoon to make a short trip to Smygehuk and have an icecram at the southern shore. So we drove the 35km to this place. 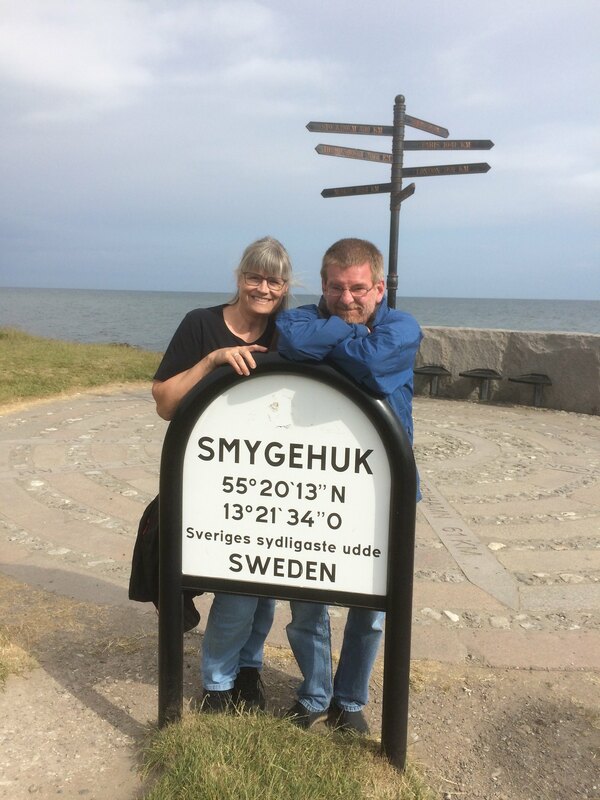 The reason was not only a delicious icecream, but also that we were at the southernmost point of Sweden - a must, if you want to visit the northernmost point of Norway, too! Good idea and thank, you Petra! 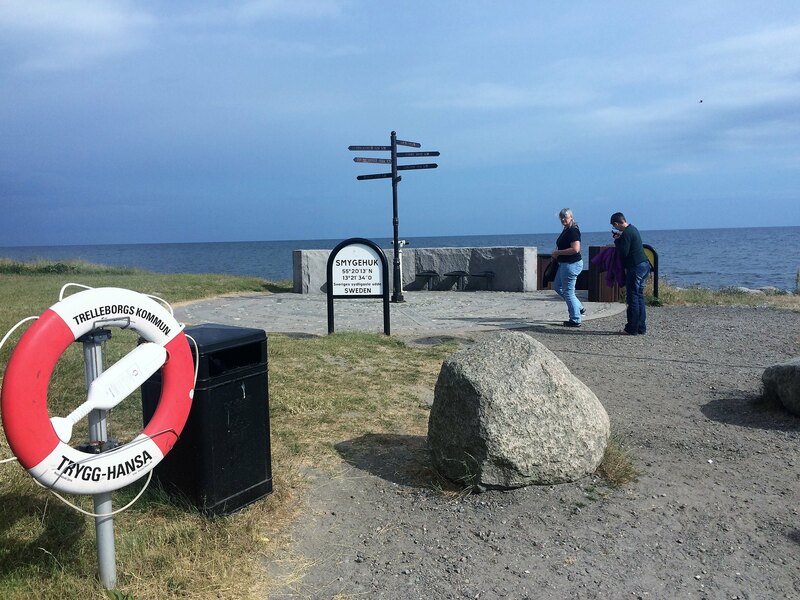 But without further delay I have to specially like you two at Sweden's "Lands End" - and a useful position for comparison when you eventually reach the latitude of Nordkapp! Regine was constantly checking various weather forecasts and they all predicted the same situation: Four more days of very good and sunny times and then a big change to rain and wind. So something you don't need and want on that partucular rock far up in the North. So we said good-bye to our friends in the next morning and headed North. 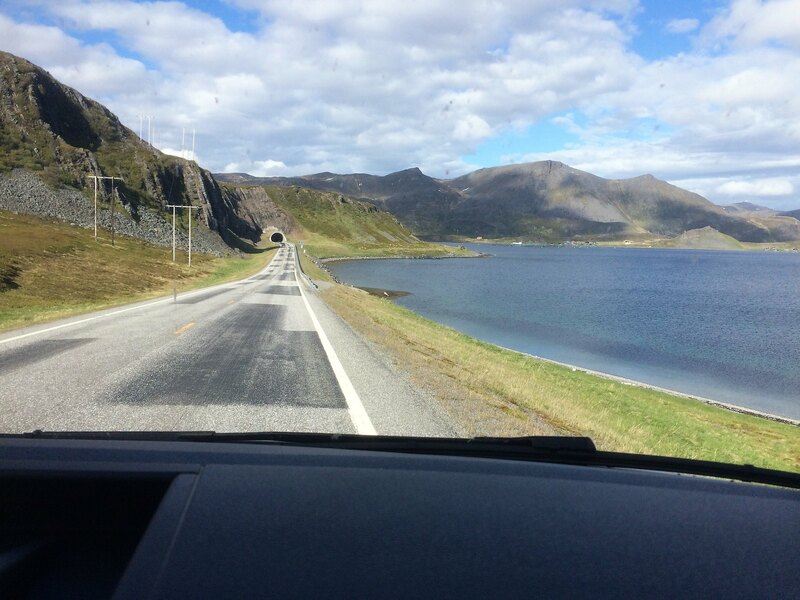 Our planning for the trip was anyhow to spent less time in Sweden and most of our days on the Lofoten Islands. 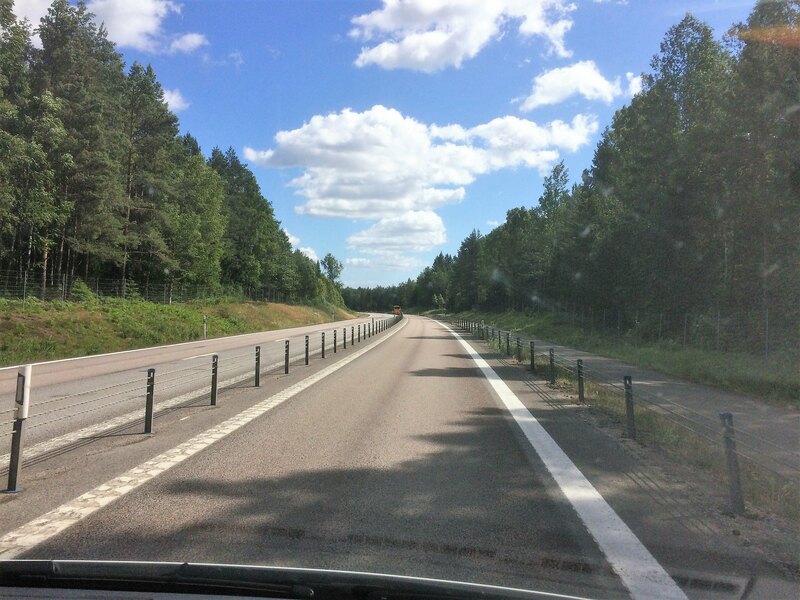 So we took the highway towards Göteborg and soon passed Helsingborg. Now it was time to look out for our dinner... even if it was just lunchtime. 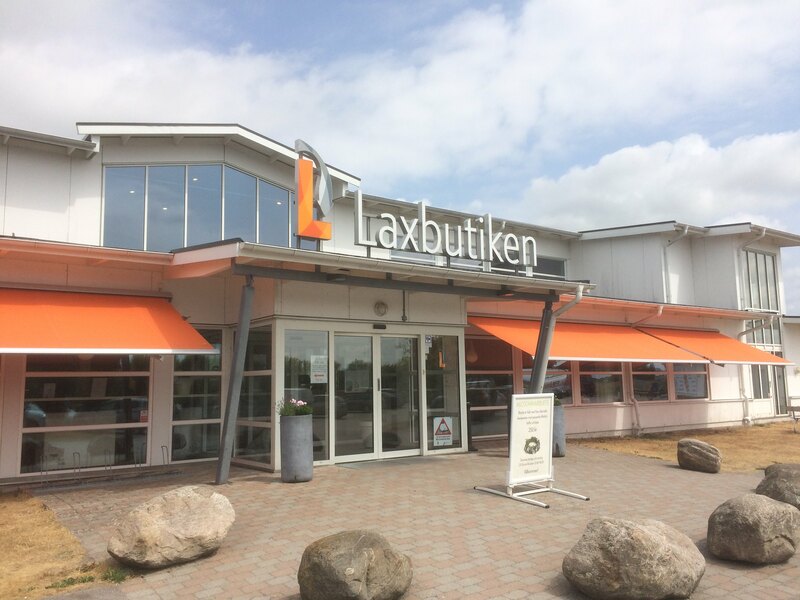 From a former visit to Helsingborg we knew the restaurant and shop Laxbutiken at exit 49 on the E6 (there is another one at exit 93 between Göteborg and Oslo). They offer really delicious smoked salmon and related food, so it was a must to stop here. They even have the Lax-o-Mat, an automatic shop, which currently is marked as closed, but normally you can buy there 24h/7d. Then we proceeded to Göteborg, as suddenly a small lamp in the dashboard warned, there might be a problem with the exhaust filter system. No problem, the next VW service was found quickly and we showed up there. But what a disappointment: a bored employee stated, nobody had time for a quick check today and wanted to arrange an appointment for the next day. I told him that we are on a travel through and don't want to have an overnight stay and asked him for the next service point. He just gave me an address, but i had to call there for myself. Thanks and F... Off, VW Kungsbacka! A complete different situation at our next stop. Volkswagen Sisjön informed not only the receptionist about our coming, they even prepared a free test stand and a German speaking colleague for our information. Immediately they tested, detected just a minor problem, which allowed us to proceed without sorrows and sent us back on the road after 45 min for an absolute fair amount of money. ***** stars and you have deserved to get this link, thank you, guys. 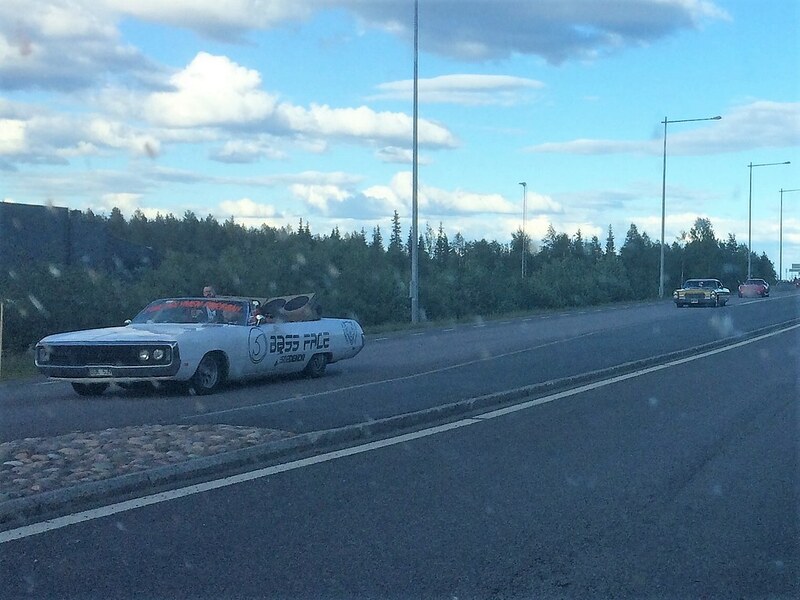 Happy, that we just have a hypermotivated sensor in our car, we proceeded to Göteborg, because of the delay now in upcoming rush-hour. Some table showed us the amount of the street toll, but we saw no photo bridges, toll stations or similar. Weeks later we received an invoice at home for 2 Euro something, which i paid then. 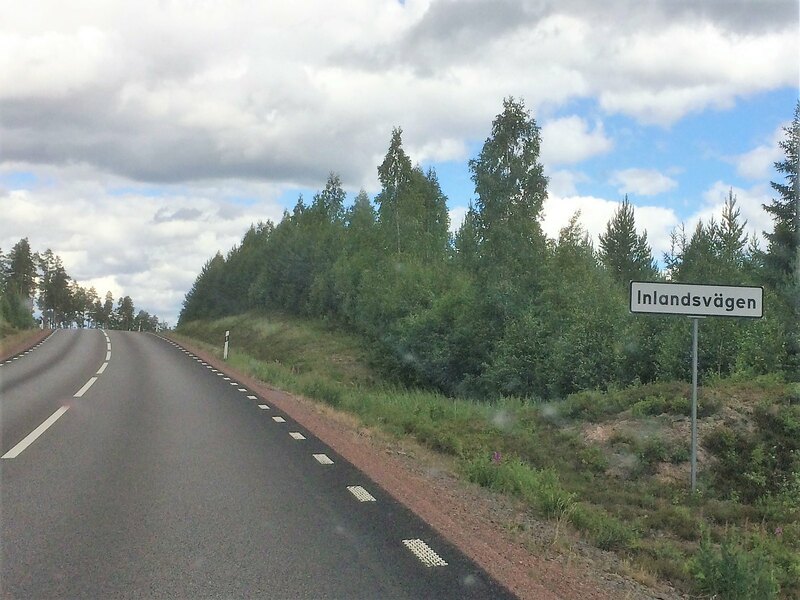 We changed now from E6 to E45, to follow the longest throughroad of Sweden on it's full distance of 1690km to Karesuando. 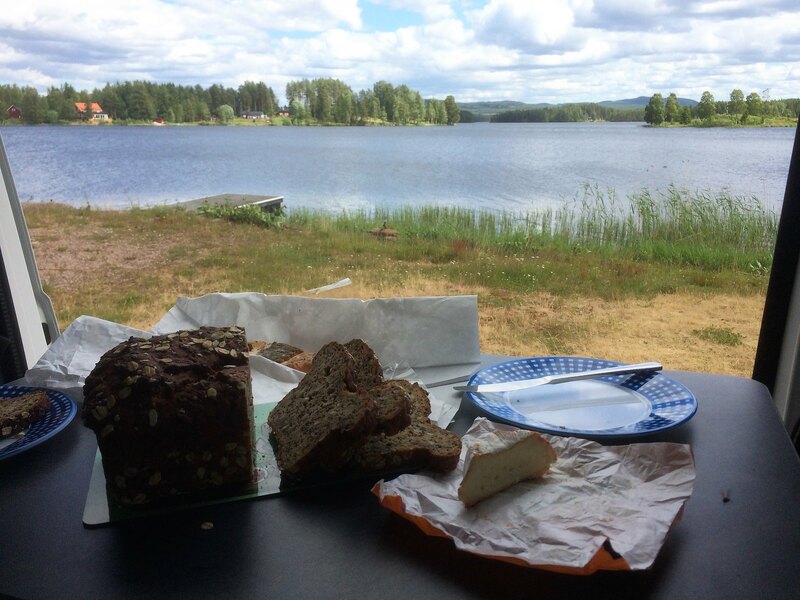 Thanks to our sensor lamp we had a quite late lunch (5 p.m.) in Trollhättan. 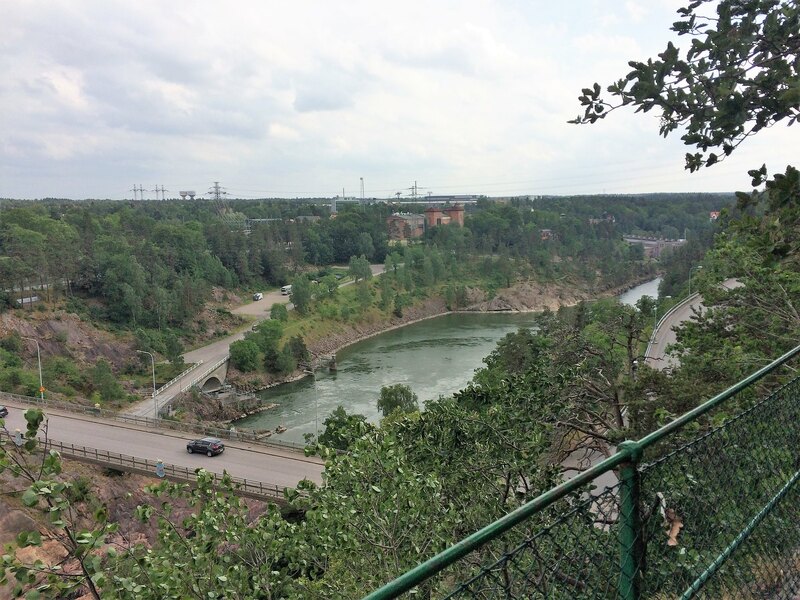 The Saab Car museum was already closed, so we visited a very nice park around the water power stations and had a very interesting walk there. View from the bridge on a closed waterfall. 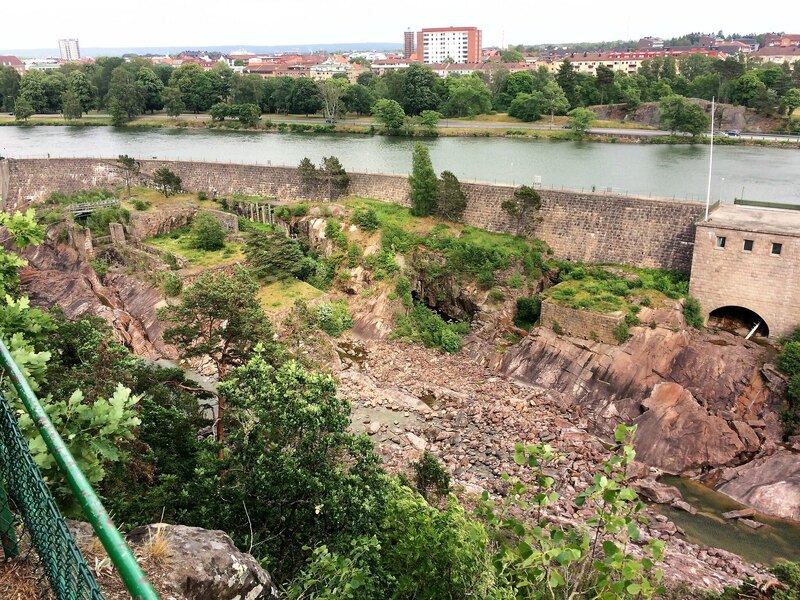 View from a round path downstream to more power plants and towards the historic Saab factory, now Innovatum Centre. And finally the view upstreams. That was a nice walk and you can easily spend a whole day there. 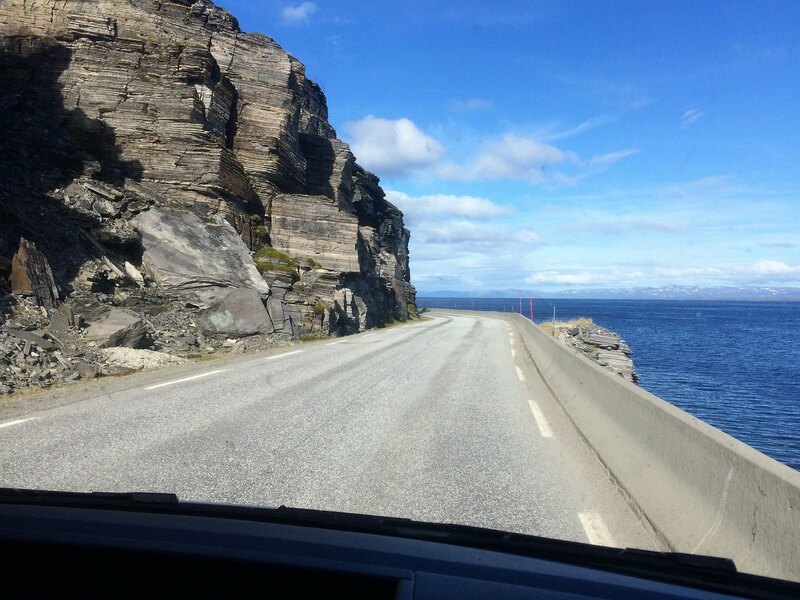 But as you know: the bad weather was waiting behind the Nordkapp-rock. 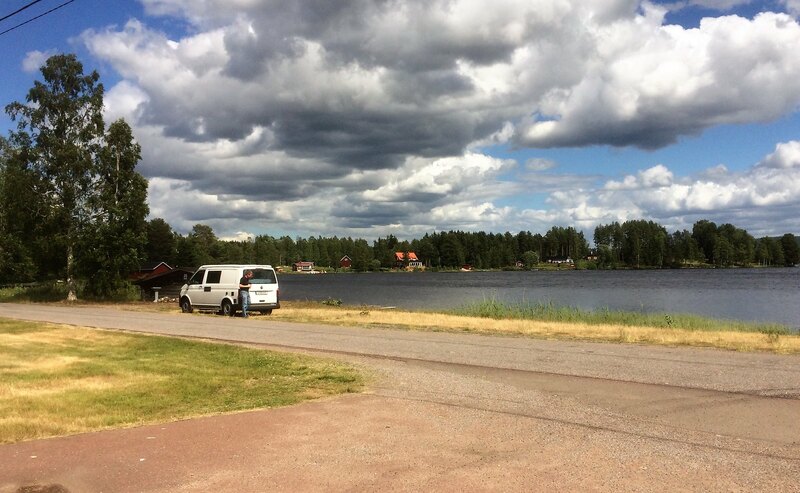 So we made a few more kilometers and finally found in Mellerud a beautiful campsite, right, before it started to rain. 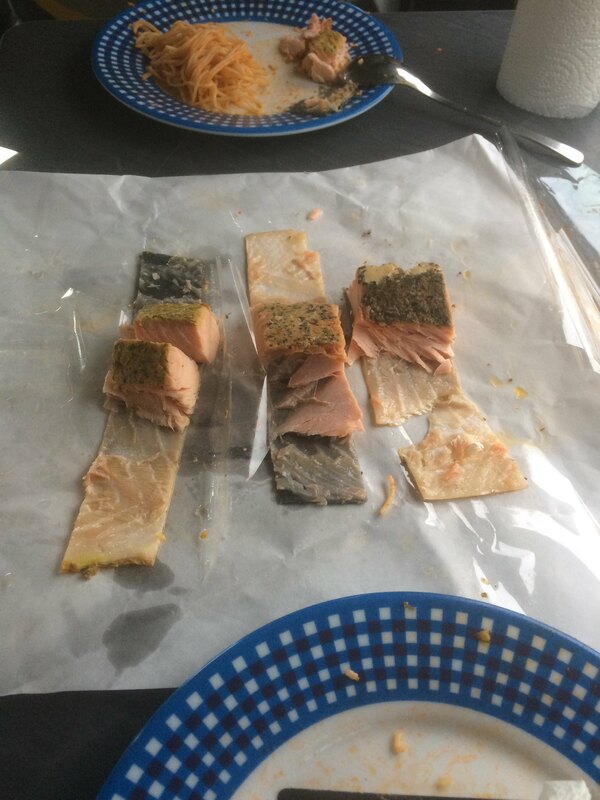 So we had our salmon dinner after choosing a pitch. Smoked salmon in different variations and spaghetti with red pesto. 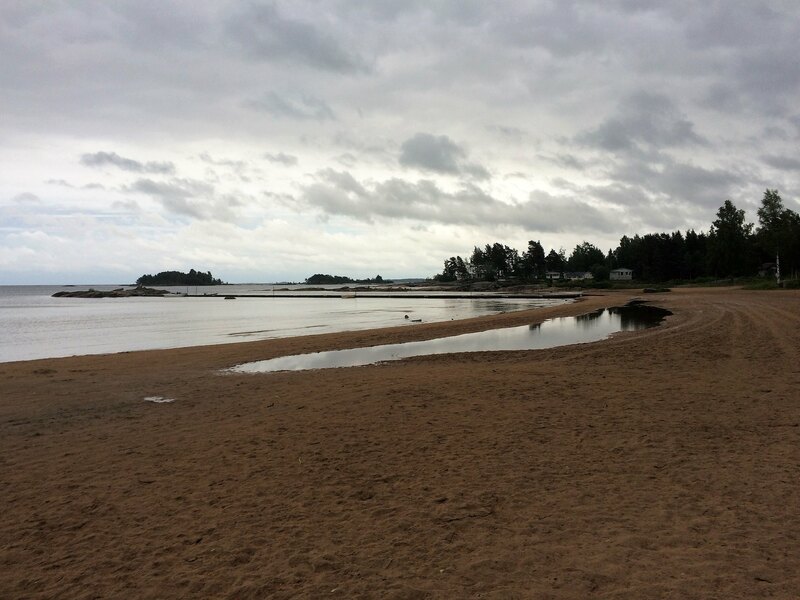 Later in the evening the sky cleared up again and we had a nice beach walk at the shore of the Vänern Lake. Last edited by Ralf__; November 15th, 2018, 10:25. I Watch your trip report with pleasure….and envy. Oh, Christmas came early this year! Nothing beats looking at summer-holiday photo-reports like this as winter sets in with darkness, wet and cold weather and short days. This report will surely entertain me a lot. This start is great - love reading about your adventure so very much. Believe me, but I don't think I have ever been to Gothenburg. As far as I remember. Thank you all for your nice comments. 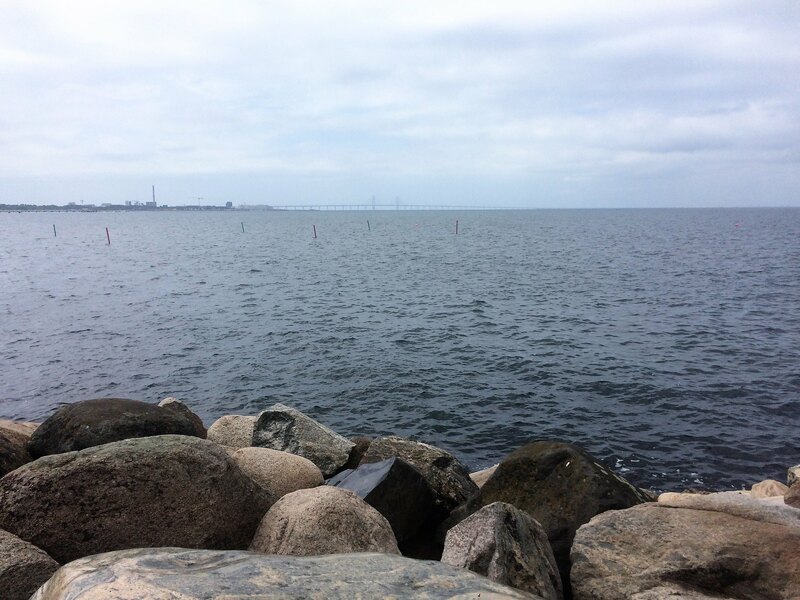 We drove three times through Göteborg now but this was our first stop, but only at the VW service! 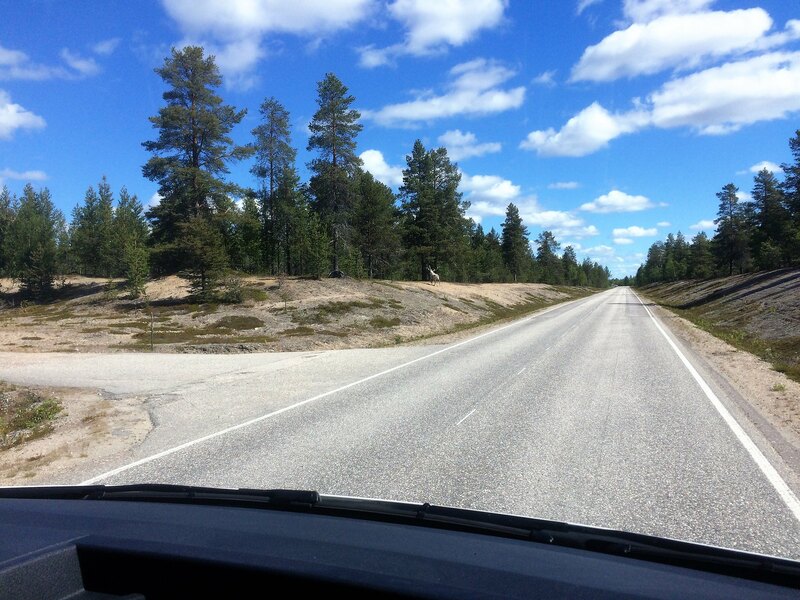 So the task for the next days was "making miles" and from here on the E45 was as promised: woods, lakes, hills, reindeers, lakes, woods, hills.... and very less traffic. 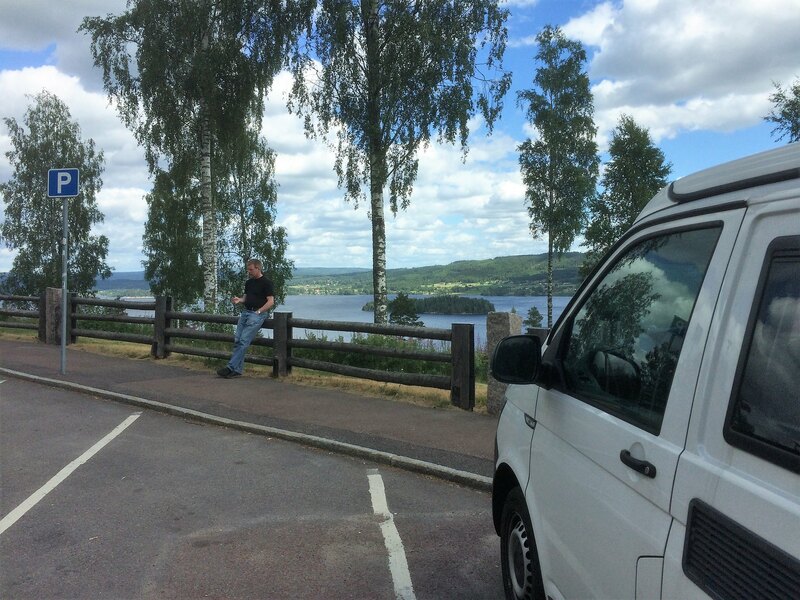 We had our first stop at a lake called Övre Fryken. For us Mid-Europeans funny road signs occured and showed us, that we are on the right way. By the way, they use different snow-scooters in different parts of Sweden. I guess, this is more a vintage style one. Our guidebook of the E45 recommended to make a stop in Malung because of it's famous leather handicraft shops, and so we did. But we were a little disappointed, it was also a bit vintage style like the roadsign. But there was a lot to see on the streets. 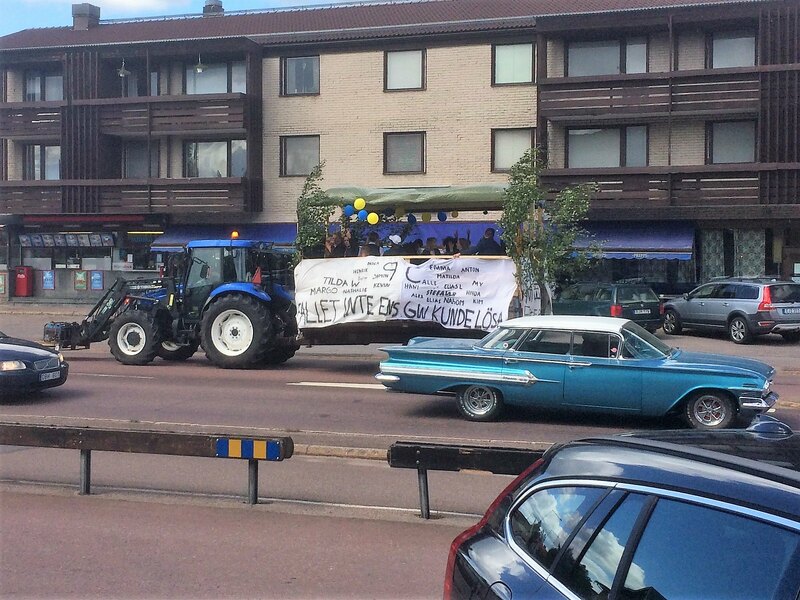 This traktor with a rolling party was driving all around the city, accompanied by historic US-cars. We did not know the reason, but maybe someone can identify the transparent. #7:4 The "party" is due to "schools out". This seems to be a bit odd since it's consisting of a 9th class (15 years age). 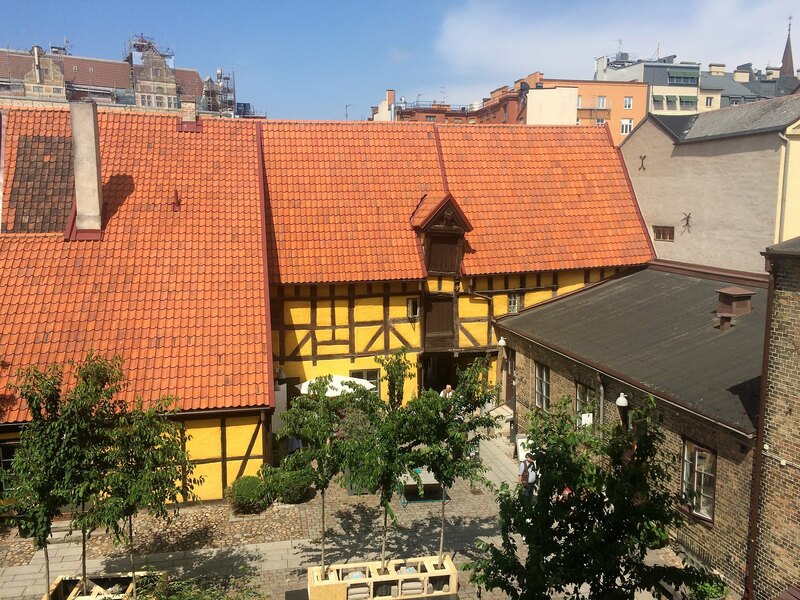 The most usual (or should I say mandatory) is that the people finishing their "gymnasium" (19 years age) are celebrating that way - this is a bit similar to the Norwegian "Russ". Now it was time to watch out for a lunch place. 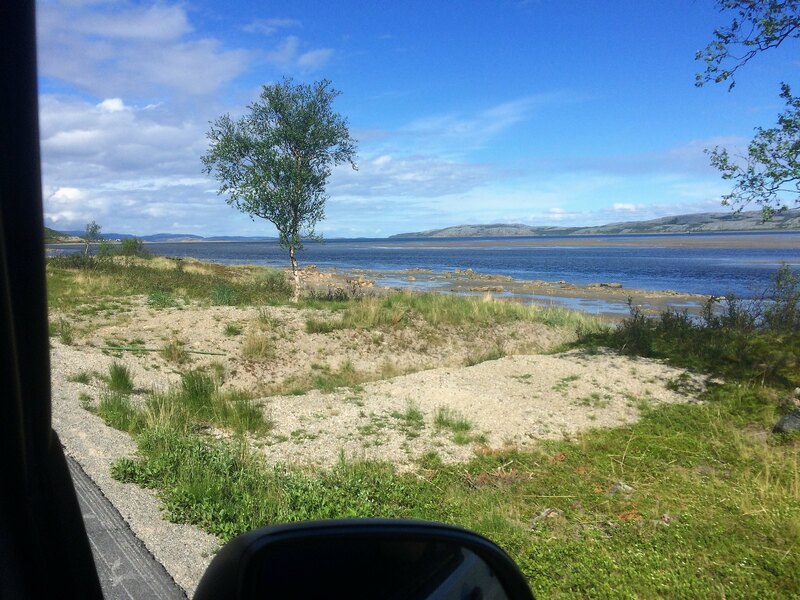 And soon we found a promising place on the map, a small road was leading away from the E45 to a lake and a boat shed. 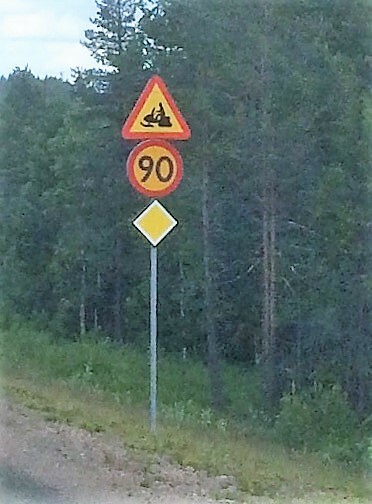 A sign was telling the story of the Kättbo Kyrkbåt. In which the people sailed over to the church, before the bridge had been built. 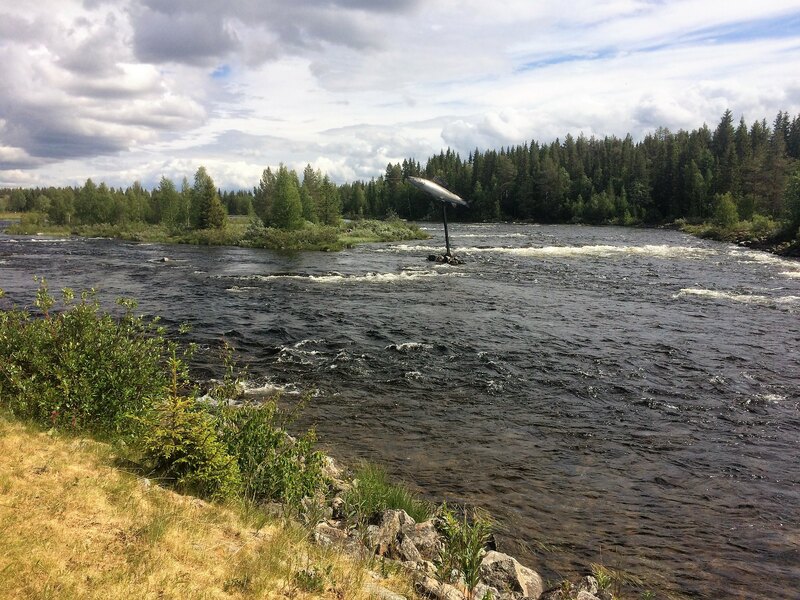 We continued our trip and had the next stop in Mora, to refill our fridge and the food storage. We start in Germany with a small amount of food, because we love to try local products. Because of my rheumatic disease i need to avoid some food like pork meat and wheat flour, so i will need some time to look around and compare things and so on. Since we did not want to enerve our friends in Malmö, this would be our first real food shopping in Sweden. We found a ICA Maxi in Mora and that was really huge. I had fun, until Regine lost patience after an hour or so. So then we went to pay and proceeded our way North. 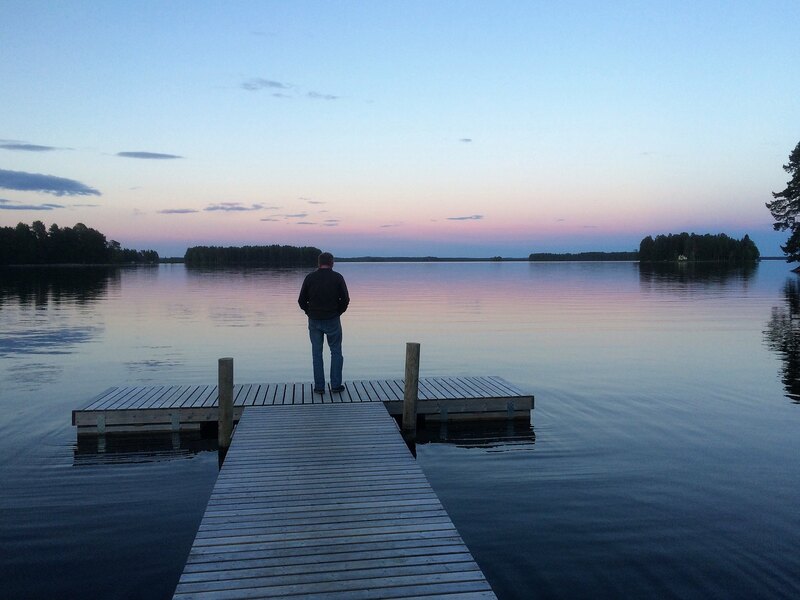 We had the situation now, we experience often, when we are on our way in times of the midnightsun. You don't feel the evening come. So we drove as long as a campsite would offer an open reception. 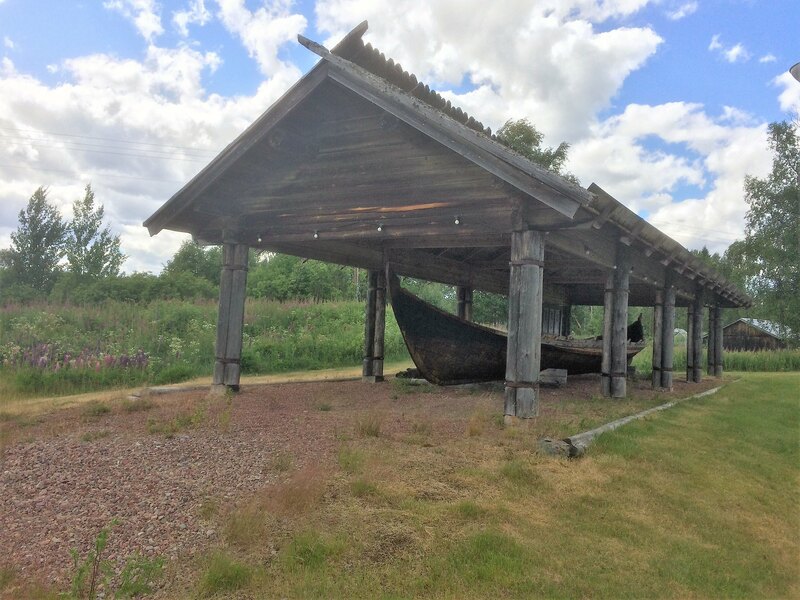 And there was a promising site in Näsviken near Strömsund open until 10 p.m. What a place! And as you know..... the rain is waiting behind that particular rock far up in the North. Btw I really like that last picture! 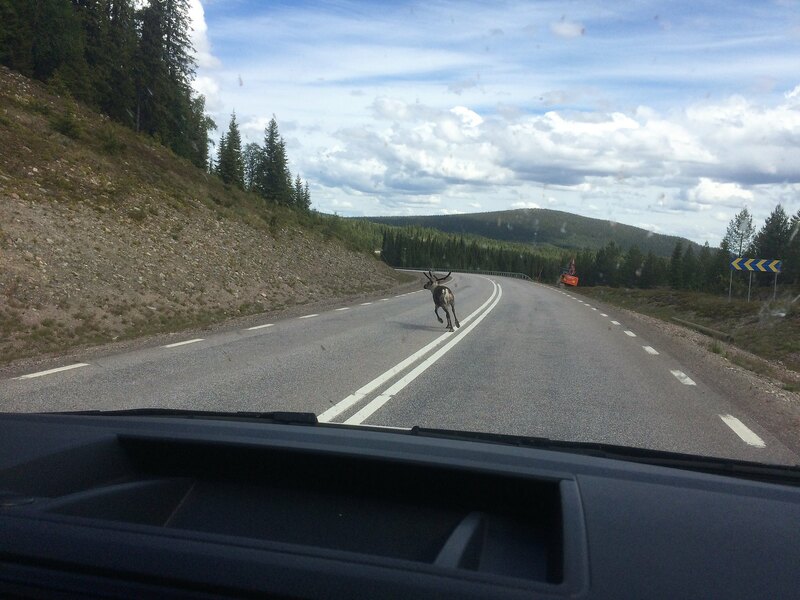 Now the reindeers become a common sight and you have to watch out for them constantly. We also saw a moose cow, but we were to slow with the camera. the rain is waiting behind that particular rock far up in the North. 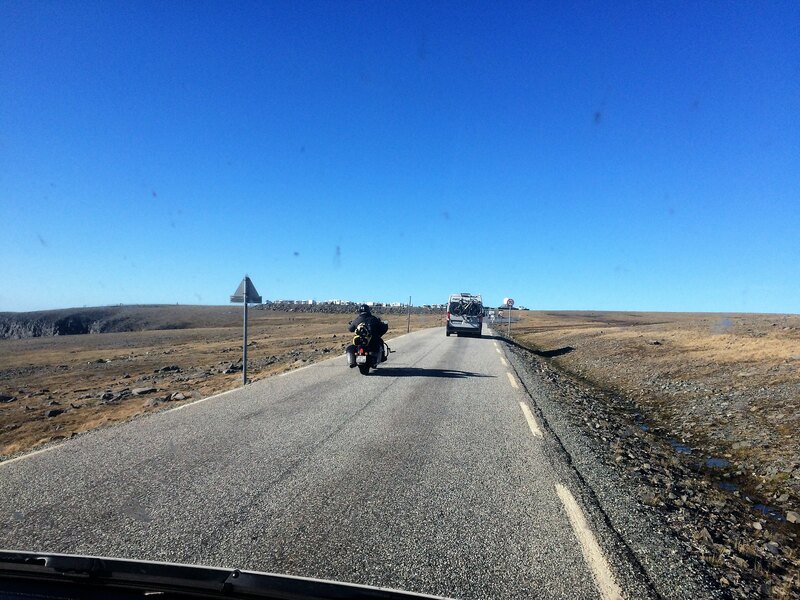 And so we passed Storuman, Sorsele, Arvidsjaur without stop and reached the polar circle in the afternoon for a late lunch. Nothing spectacular, Regine had a very good capuccino there and the friendly waitor encouraged her to fetch her thermo cup from the car to refill just for the price of one. You always look in friendly faces, when the season is just about to begin! 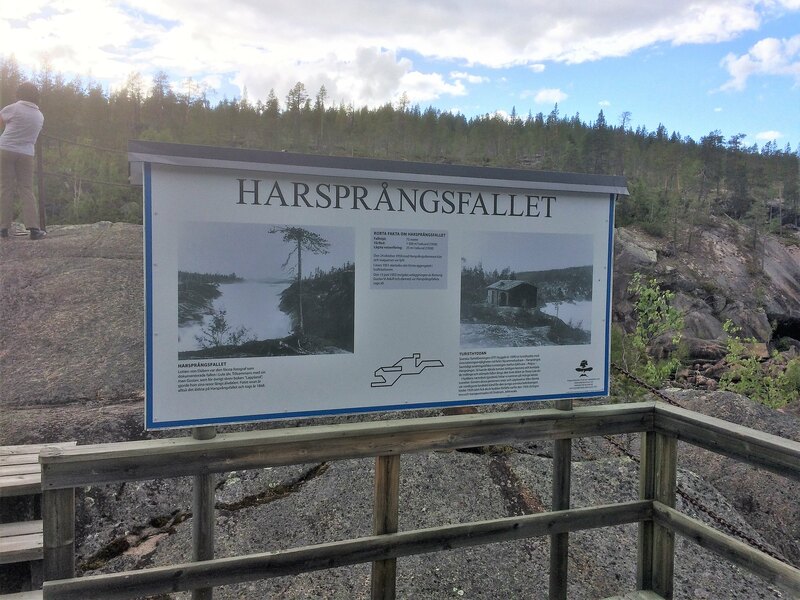 A sign told us the history of the place and that it is opened once a year at "fallens dager" and you can admire it. But of course it was not fallens dager today. 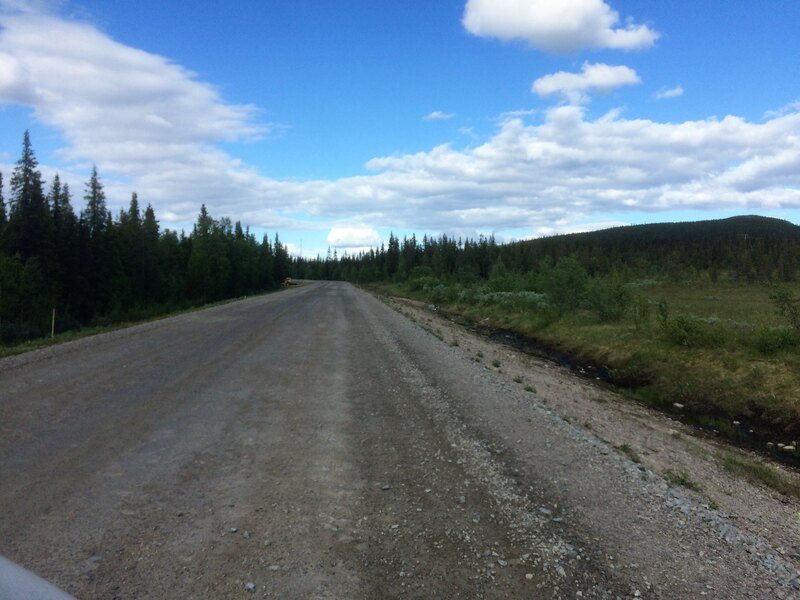 Today we had long passages of gravel roads, which were very uncomfortable. This was because it was roadwork, they renewed the tarmac on the E45. Very shaky! Amazing, how many of them meet in such a remote area and how far many have been driven to come here. Enjoying this Ralf. We'd just left the UK at this point! You were following a route that is very (sometimes too!) familiar to us. 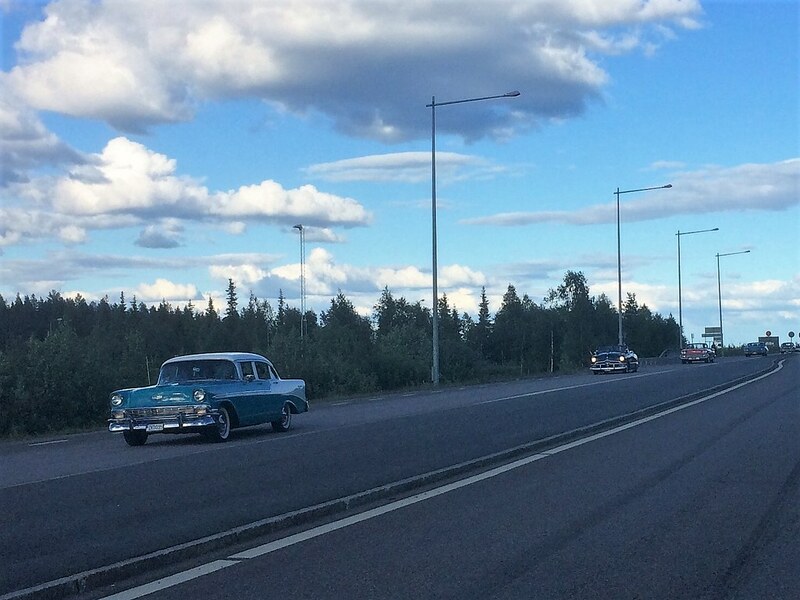 (Re the American Cars - we got caught up in a similar, huge, event in Umeå on our way south in early July. Made for a noisy night in the hotel as the cars cruised around until the early hours). 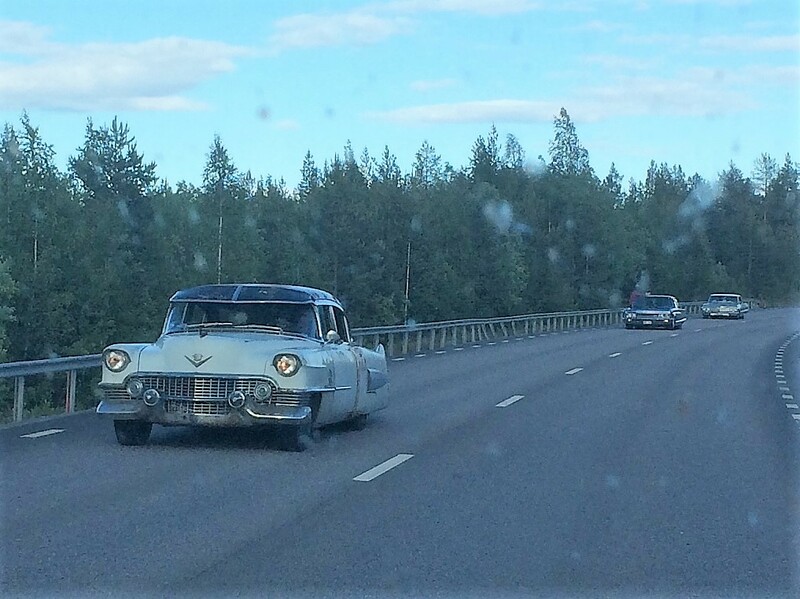 This American car culture is huge in Sweden. I believe that even some US folks thinks that this culture is more viral and alive in Sweden than back in the states. What a great way to spend time during lunch in front of the widescreen pc! The schools in Sweden plan their holidays individually. 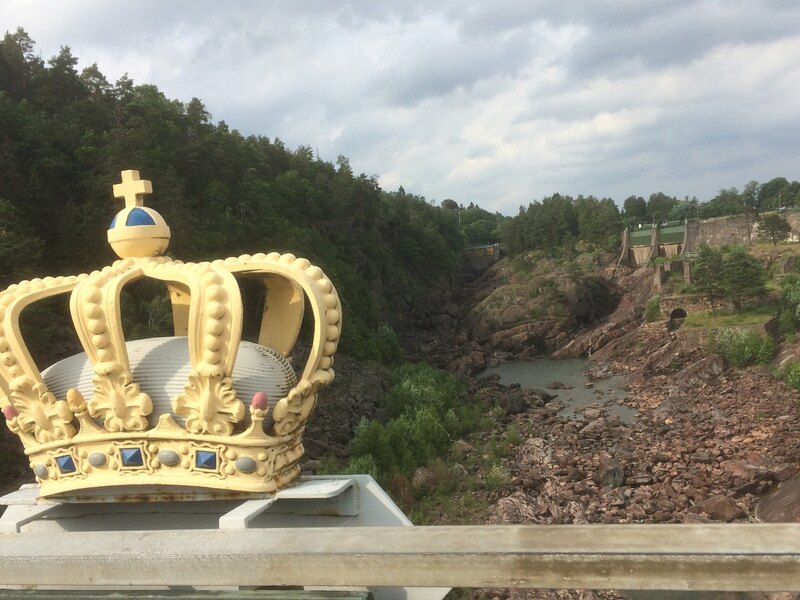 Even here in Strängnäs it is common that the different vacation periods differs +/-1 week between schools. 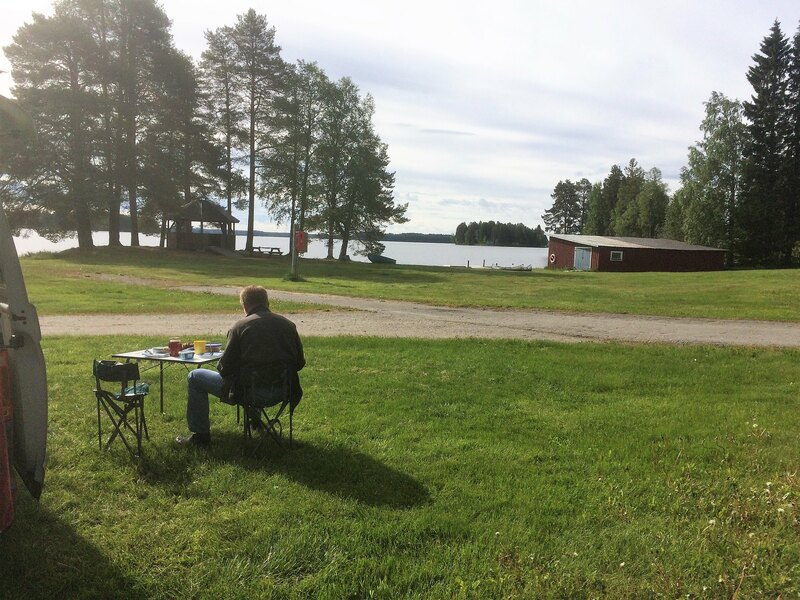 I love this image - the ultimate summer memory image: reminds me of my own summers in Sweden during childhood as well as adulthood. What an amazing trip - despite all those kilometres. Knowing how dull the view of forests are after hours and hours can be, it was wonderful to see that you occasionally stopped for a break in perfect surroundings. 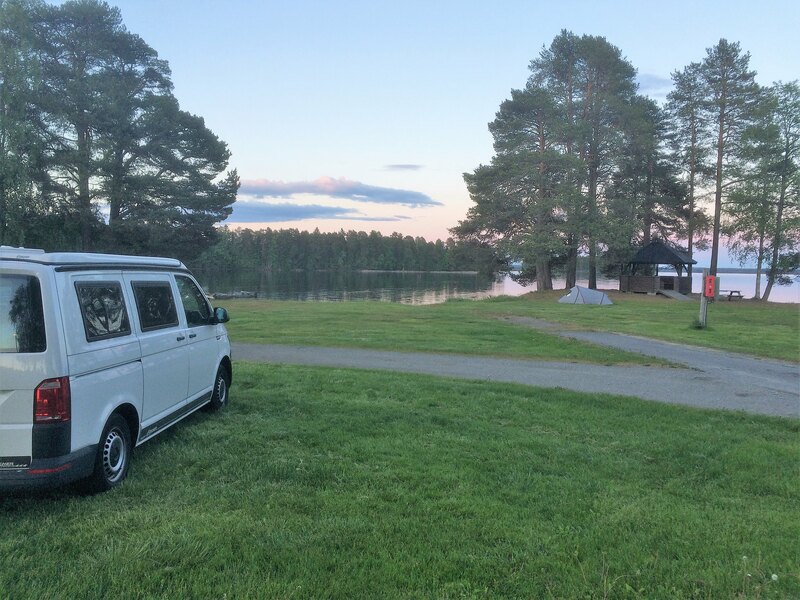 Summer trips like these are amazing, but I have never done a trip in a "bobil" caravan. The trip start looks so memorable and so wonderful. It's something about the excitement on what's ahead.... days off work, and up to you where you go, how long you go, and where you stop. 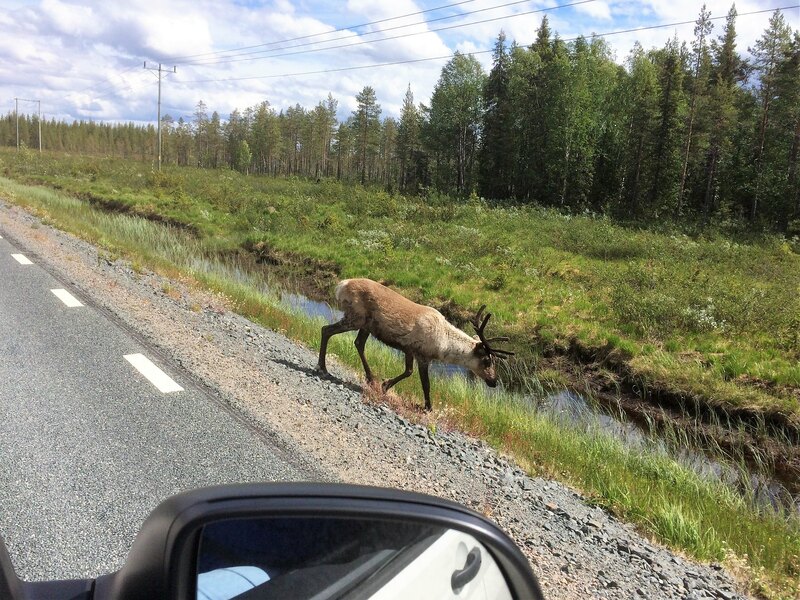 The reindeers like the Sami don't care too much about our borders, so there was no different look or behaviour in Finland. The finnish part is only short and soon we came to Norway and saw the first mountains in the distance. 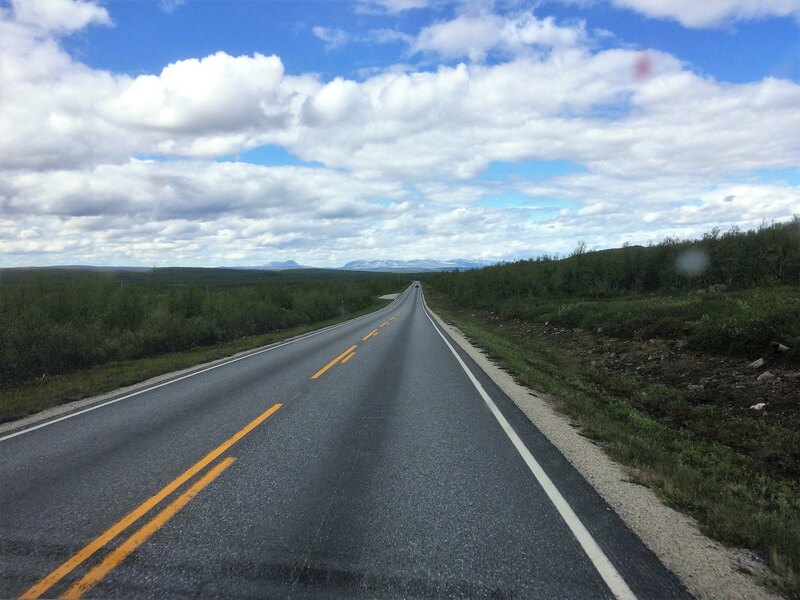 We passed Karasjok and the Sami Centre. 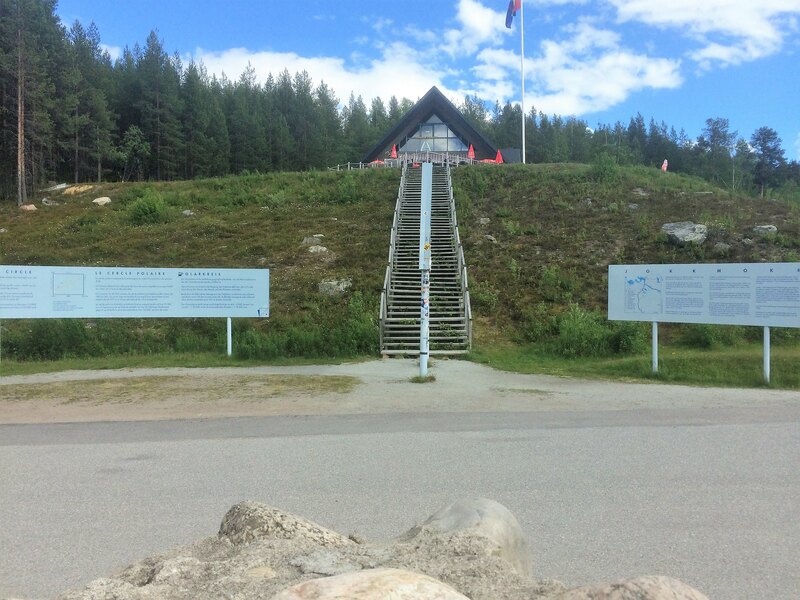 We have seen a lot of documentations and TV reports about the Sami culture and the video about the museum attracted us not much. And as we saw 4 or 5 busses on the parking space and three more were arriving, our decision was clear: Hit the road! In Lakselv we reached the sea again. 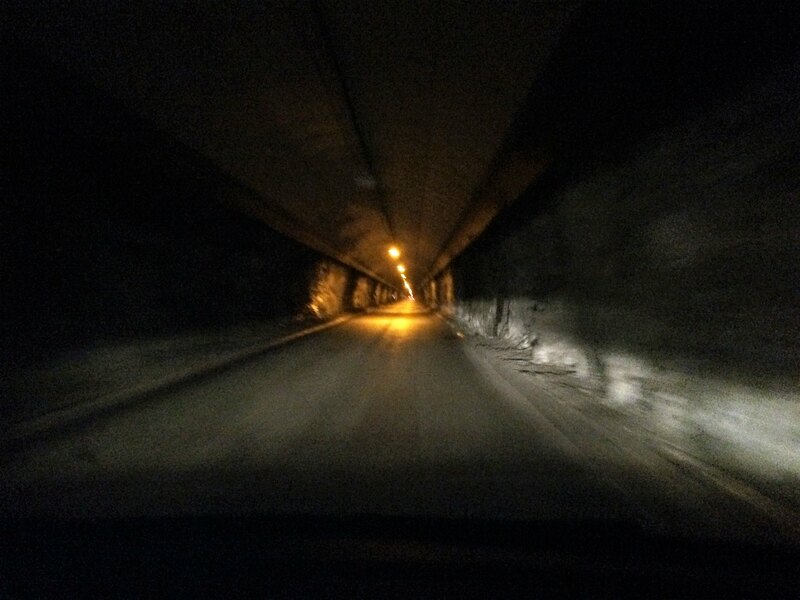 And we crossed soon our first Norwegian tunnel during this trip. And many, many more should come. 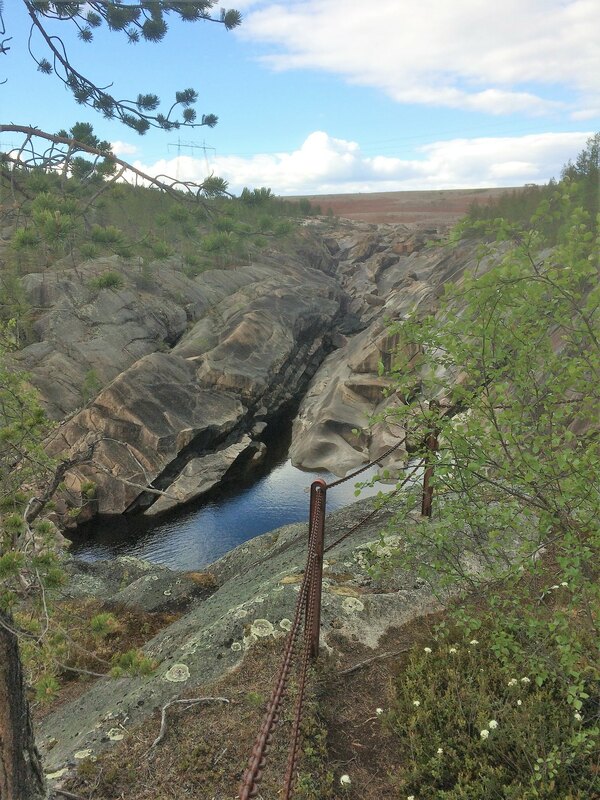 Interesting rock formations along the coast along Porsangerfjorden. Minutes later a sea eagle was sitting on such a rock very close to the road. Unfortunately the moment was too short to make a picture.